Happy Wednesday! 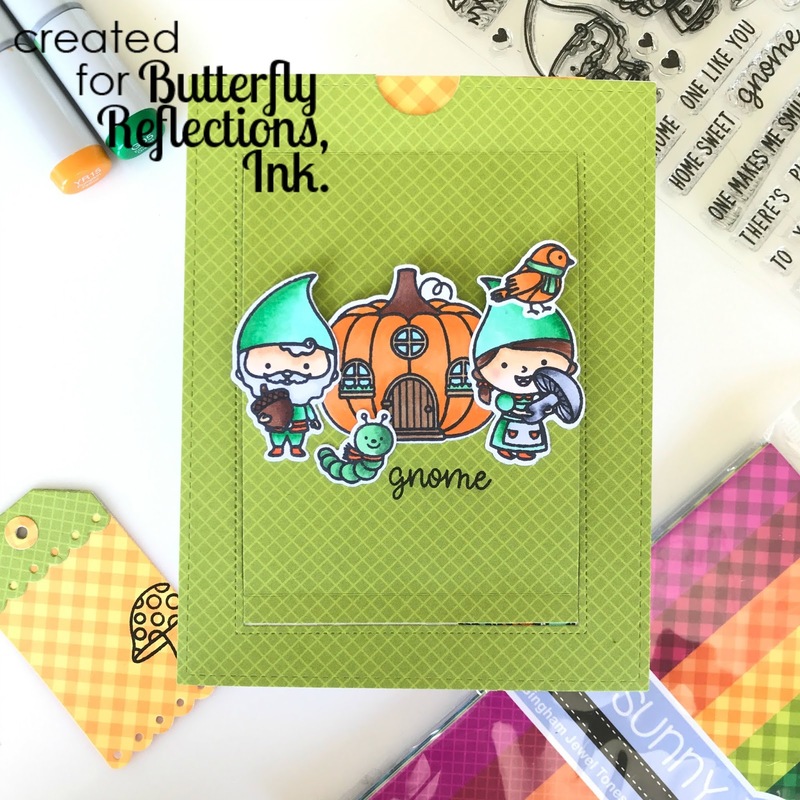 It's Lindsay here on the Butterfly Reflections, Ink blog. When I first saw this Sliding Window Die from Sunny Studio I knew I had to have it! I haven't delved too much in to interactive cards, but this seemed like a really good place to start. 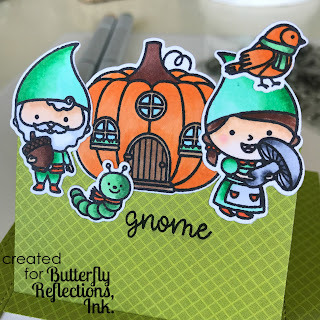 I used the Home Sweet Gnome Stamp Set from Sunny Studios for this card since I'm slowly getting in to the fall spirit. Here in Hawaii it's hot as usual, but we are moving to Oregon this month so I'm excited to have a cool, festive fall season this year! 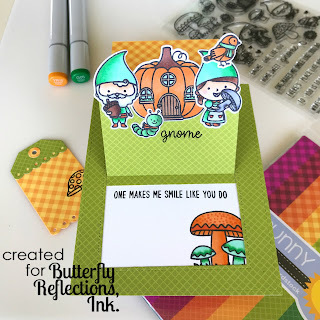 I started with stamping out the images from Home Sweet Gnome Stamp Set with Amalgam Ink from Gina K Designs and colored them with Copic Markers. I then die cut them using the Coordinating Dies and set them aside while I worked on the rest of the card. I started the card assembly with the Gingham Jewel Tones 6x6 Paper Pad from Sunny Studios. I really feel that their jewel tone paper pads are perfect for fall cards, they have Amazing Argyle, Dots and Stripes, and Preppy Prints all with the same color tones that would work really well together. I cut he top panel (green) to 4 1/4" x 5 1/2". Then, using the main die from the Sliding Window Die set I cut out the middle cut which will represent the sliding aspect of the card. During that die cut, I also added the half circle die at the top of the panel. This creates an opening for the recipient to pull out the sliding aspect of the card. You then score along the top, middle, and bottom lines using a Bone Folder. I then cut another piece (orange) from the Gingham Jewels Tones 6x6 Paper Pad to 5" x 3 1/4" (this is slightly larger than the Sunny Studios Tutorial recommends, but I felt it worked well for me). This is the piece that you pull up on to create the sliding window. 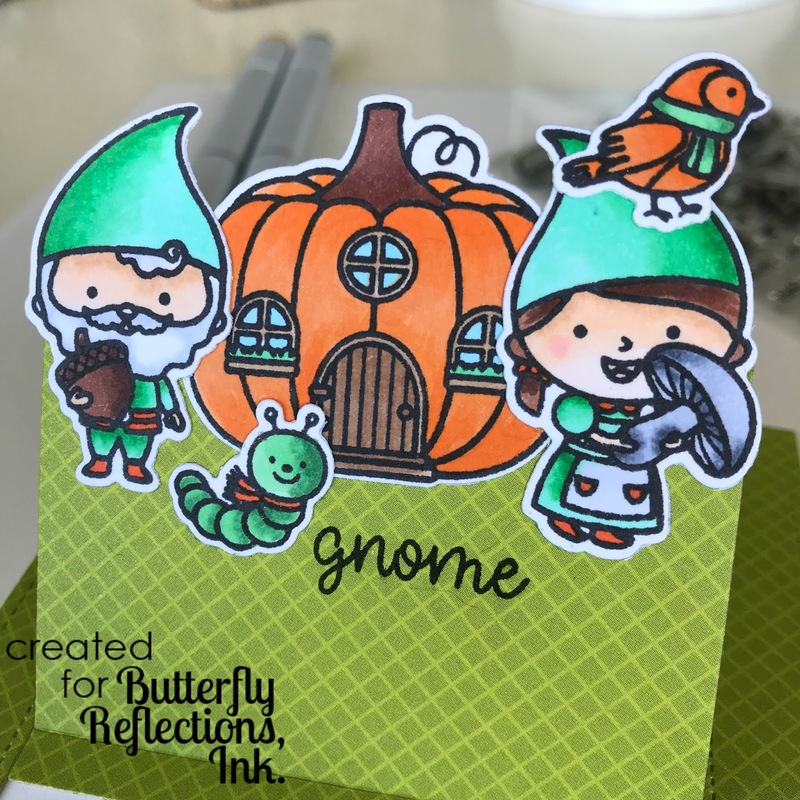 For the inside of the card, I just chose a white piece of card stock that I stamped and copic colored an image and sentiment from the Home Sweet Gnome Stamp Set. In the picture above you can see I stamped the large cluster of mushrooms and the sentiment to show when the sliding mechanism is up. From there it's all assembly! I adhered the orange piece to the very bottom of the sliding aspect of the green piece using 1/8" Scor Tape. Then, to adhere green piece to the white base, I used 3/8" Scor Tape along the sides and bottom of the green piece and adhered that (make sure you don't adhere the top, or the sliding mechanism won't happen). Then I added in my images to only the lower half of the sliding mechanism (again, to let the mechanism flow smoothly you don't want to adhere anything to the top portion) using Mono Permanent Tape Adhesive. You could choose to adhere this whole thing to a card base, but I decided I would just write my message on the inside of the slider mechanism. As a little bonus I created a matching tag, which was also die cut from the Sliding Window Die set and stamped with an image from the Home Sweet Gnome Stamp Set. For a video describing how to assemble this card in detail, you can go to Sunny Studio's YouTube link here, and go to the 11:10 mark to see in real time how to assemble this card. I found this video very helpful when putting together my card and worked along with it as I went. It's very simple and you'll probably only need to watch it once or twice and you'll be good to go! Technical Hero E Rainbow Bee!